The Statue of Unity, a memorial to Sardar Patel, is situated on an islet and, at 182 metres, is touted as the world's tallest statue. 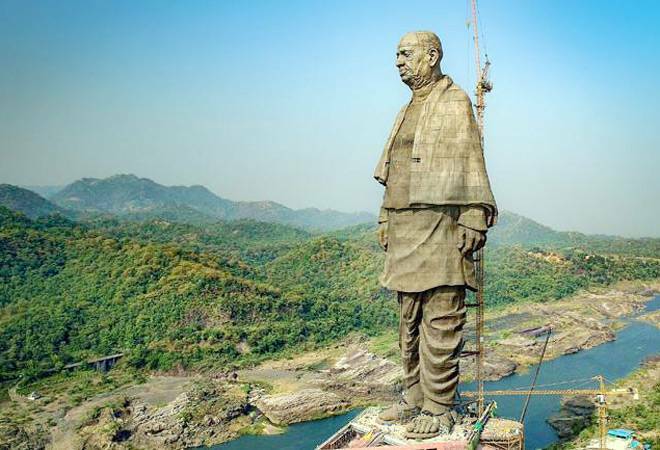 The headmen of 22 villages situated near the Sardar Sarovar Dam Monday wrote an open letter to Prime Minister Narendra Modi stating that villagers would not welcome him at the inauguration of the Statue of Unity on October 31. Local tribal leaders have also announced a boycott of the function citing destruction of natural resources due to the memorial. "We all villagers want to tell you with extreme grief that we will not welcome you on October 31. Even if you come here like an unwanted guest, you are not welcome here," it added. "If Sardar Patel could see the mass destruction of natural resources and injustice done to us, he would cry. When we are raising our issues, we are persecuted by police. Why you are not ready to listen to our plight?" the letter said. Earlier this month, tribal activists had announced that people living in 72 villages near the dam will join the protest on October 31 by not cooking food. "We have also urged tribals of the eastern belt of Gujarat, from Dang till Ambaji, to join our protest by observing bandh that day. We are confident that the entire tribal population will stand up against the injustice" said tribal leader Anand Mazgaokar. Meanwhile, unidentified persons tore and defaced posters of Modi and Chief Minister Vijay Rupani in several parts of the district during the last few days. "It happened because locals are angry. No one provoked them. We have only given call for bandh," Mazgaokar added. Gujarat Chief Secretary J N Singh Monday visited the site to take stock of ongoing preparations. "We have invited dance troupes from across the country to perform here during the inauguration. Air Force planes and helicopters would shower flowers on the statue during unveiling. I am here today to see how we can synchronise them" Singh told reporters. The Gujarat Congress also targeted the BJP government and Modi over the non-completion of Narmada canal network. Ahead of the inauguration of the statue, Leader of Opposition in Gujarat Assembly, Paresh Dhanani, wrote a letter to Rupani and demanded that the Narmada project should be declared as a national project to give a "fitting tribute" to Sardar Patel. "The construction of the dam got delayed because of litigations and stay by the Supreme Court. But, there was no ban on the construction of canal network. But, instead of completing the network, BJP only did politics. Thus, canals having cumulative length of of 20,000 kms are yet to be constructed" Dhanani said in the letter. Former Gujarat CM Shankersinh Vaghela demanded that the contribution of all the royals who had "gifted" their princely states to build a united India after independence, should get a mention in the museum built beneath the Statue of Unity. He attacked Modi saying that the statue is just a "marketing tool" for the ruling BJP and demanded that plight of tribals and poor must be heard first.